We are committed to producing fantastic boxes that are great value for money, fun to receive, and add useful sets of paints to your painting collection. We're all avid miniature painters and gamers ourselves, and happy customers mean everything to us, so get involved today! May's box was also excellent value for money, containing £26.90 worth of high quality miniature paints, for just £19.90! That's a saving of 26% on RRP. Italeri Gull Gray, Italeri Medium Gray and Italeri Graugrun RLM74 - an ideal trio for painting concrete effects using the sponge brush too. Italeri are an outstanding brand of model paint with the best coverage I’ve ever experienced! One drop of paint can cover a whole model perfectly, drying smooth and matte. Plus, I love their unique bottle design. No more getting the paint cap covered in spilled paint. As well as outstanding paint, they make a variety of high quality miniatures, making them great to check out if you’re interested in different periods of war. Their minis come in sets with their paints, so they make a nice little monthly kit. Italeri itself was founded in the 1960’s by two best friends with a love of aeroplanes and military models. They wanted to create perfect replicas of models from a range of historical time periods, and so founded the company on accurate historical research and detailed replication. They are also sticklers for quality, which I think shows in the premium nature of their acrylic paint. 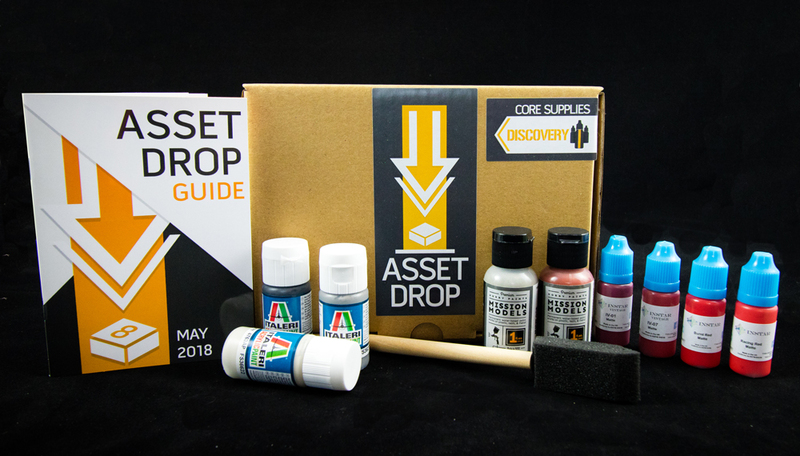 In May's drop, subscribers received a trio of grey paints that are perfect for painting concrete and stone effects. The Painting Guide covered in detail how to use the paints and the included sponge brush to paint up a realistic concrete base. We covered painting a scenic resin base, and how to mimic a concrete effect on a standard plastic base too! Mission Models new weathering paints - Transparent Light Rust and Transparent Dust. Mission Models are producing premium model paint with a revolutionary formula, and have just brought out the start of a new weathering line. I’m a big fan of weathering products and subtlety when painting, so the MMW Transparent Paints are perfect for my style! They apply subtle and highly realistic effects to miniatures with no tide marks to speak of. You can build them up for a strong effect if you want to. The paints are also transparent, as the name suggests, which is ideal for realistic rust & dust weathering. The Transparent Rust and Transparent Dust in this drop are the perfect duo to apply weathering effects to pretty much any miniature (although the dust effect works better on darker backgrounds). I found them to be highly versatile and my new go-to paints for adding a little bit of weathering to finish off a mini. INSTAR paints including: IV-01, IV-07, Burnt Red and Racing Red. This quad of red paints is ideal for painting red cloaks, which we cover in the Painting Guide. INSTAR is a brand new range of miniature paints developed here in the UK. 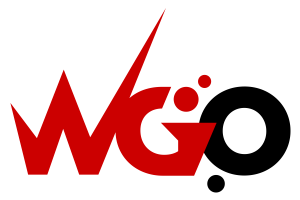 This family-run business is passionate about miniature painting and is determined to produce high quality paint at an affordable price for modellers. You’ll be pleased to know that INSTAR use dropper bottles with a precision tip (just like our Asset Dropper Bottles!) so you have better control when placing paint on the palette. These thin tips are especially useful when mixing paints as you can recreate exact amounts. Currently, INSTAR paints come in 3 different lines: standard, vintage & metallic. The vintage line recreates old out-of-production Citadel paints, and their metallics line contain some really interesting colour shifting metals. INSTAR also have each paint available in either matte or sheen. We chose to feature their reds in May's box because getting a nice bright red right is tough, and the INSTAR set of paints is ideal for it. Glazing down to the darkest IV-01 as the shadow (a rich purple-red) and starting with one of the brighter colours (Burnt Red), you can produce a rich, realistic red cloak, which we explain in detail in May's Painting Guide.